Wolfgang Frey, a practicing architect who specializes in sustainability in Freiburg, Germany, has found a way to offset his own carbon dioxide "debt" through reforestation efforts in China. 2016 marks the second year of an ongoing effort to combat climate change. Wolfgang Frey plants trees in China to offset his carbon dioxide footprint. Our forests needs to grow with the population to reduce our collective carbon footprint. 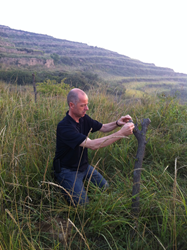 In the spring of 2014 sustainable architect Wolfgang Frey began a reforestation project on the Chinese mountain Xishan (‘West Mountain’ in English) in Taiyuan in the Chinese province of Shanxi. This week, Mr. Frey celebrates the second year of his efforts to reduce his carbon footprint in China. Mr. Frey has planted over 6,000 trees on 12.4 acres. Every growing plant absorbs CO2. Wolfgang Frey’s goal is to compensate for his own personal CO2 emissions as an architect with the help of the trees he plants. "A polemic solution would be to simply stop building altogether," says Wolfgang Frey. "Given our ever-growing world population, however, that’s not really an option." Wolfgang Frey’s sustainable architecture firm Frey Architekten has planned several large-scale housing and commercial complexes such as Heidelberg Village and Smart Green Tower based on passive house standards with a low carbon footprint. The reforestation effort is intended to make up for the greenhouse gas emissions produced by driving to construction sites, the use of construction machinery and even the CO2 emissions produced when Wolfgang Frey flies to China. Ideally, the trees should absorb the same amount of carbon dioxide that he produces. Because the climate in the industrial city of Taiyuan is extremely hot and arid in the summer time, Mr. Frey started out by planting acacia trees. This type of tree is also known as pioneer wood because it still manages to grow despite the rather unfertile ground and critical climate. Apart from the absorption of carbon dioxide, the trees also provide other positive aspects such as the production of oxygen and the overall improvement to the micro-climate. The reforestation project has not yet ended: Wolfgang Frey wants to expand his forest. He flies to China about three times a year and can take between 150 and 200 saplings from Germany each time, resulting in about 600 acacia trees annually. In addition, date trees bought directly from China are being planted. The plan is to continue to expand the forest’s acreage. Back in Germany, Wolfgang Frey also owns 111 acres of forest, the wood from which is used – among other things – for sustainable projects.